Project Data: An urban renewal project designed as a neo-traditional, pedestrian-oriented community, and architecturally influenced by the historic Olde Town Arvada downtown. 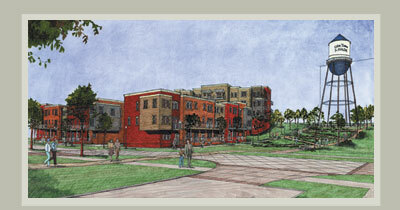 Currently under construction, this development is to be a showcase of New Urbanism in action. The neo-traditional focus of this project has presented interesting engineering challenges in the areas of grading, utilities, site planning, and tree preservation. Originally controversial, and still very high profile, the success of this project has been dependent on a team approach to the public planning process and high levels of communication between consultants, clients, approval agencies, and the public. Water Tower Village is a 26-acre residential neighborhood and one of the most significant portions of the 443-acre redevelopment of historic Olde Town Arvada. To oversee the project, the Arvada City Council established the Arvada Urban Renewal Authority (AURA), the governing body that negotiated the residential development agreement. The master plan for Water Tower Village includes the creation of a 700-unit residential village, with Concert American Homes responsible for approximately 50 percent of the site.